Dalithoy is the KING of konkani cuisine. A must to have at all occassions for Konkani's (people speaking Konkani). Dalithoy is the most basic and most loved dish of Konkani cuisine. Konkani's just cannot live without this simple, flavourful daal made from split yellow lentils. :-) Dalithoy with rice is all that we Konkani's need to make a good, hearty lunch/dinner. Can't write enough to explain dalithoy's importance in Konkani cuisine. It is foundly called as thoy or DDT which stands for dat (thick) dalithoy. 1. Boil washed lentils in a pressure cooker along with slit green chillies and 2 cups of water, until the lentil is cooked well and mushy. 2. Transfer the cooked lentil into a cooking vessel, add 1/2 to 1 cup of water if required. Dalithoy is usually thick in consistency, but you can make it watery if you like. Gauge the level of thickness you would like your daal to be and appropriately add more water as required. 4. For added flavour add lots of chopped fresh coriander, just before you put off the flame and remove off heat. 5. Seasoning the daal: Heat ghee in a tempering pan, add mustard seeds. When they start spluttering add curry leaves and roughly broken pieces of red chilli. Fry them for a minute. Then add lots of asafoetida powder to the seasoning if you haven't added asafoetida to the dal earlier. Remove off heat, add the seasoning to the daal and mix well. Serve dalithoy hot with a bowl of steaming hot rice and enjoy! You can also add loads of ghee on top for added flavour or eat rice mixed with dalithoy and lemon juice for added taste. The best combo with dalithoy is any sukke like cabbage batate sukke, beans batate sukke, mitke sanga sukke or batate song. P.S: Add green chillies depending on how spicy they are and depending on how spicy you want your daal to be. Dalithoy is prepared by konkani's in a zillion ways with very minor variations. A lot of people use ginger in dalithoy. My MIL boils the lentil with an inch of ginger and turmeric for health reasons and for taste too. Ginger takes care of your tummy and any gastric problems that may arise due the consumption of lentils. Turmeric adds colour to dalithoy and is very good for your body's immunity. If you don't want the green chillies to cook along with the lentils as it could make the dalithoy extra spicy or if you forget to add the green chillies while pressure cooking the lentils, then you can add slit green chillies to the cooked daal bisque while you keep it for boiling in step 2 above. You'll have to use lots of green chillies in that case for the required spiciness and boil the bisque for an extra minute or two. 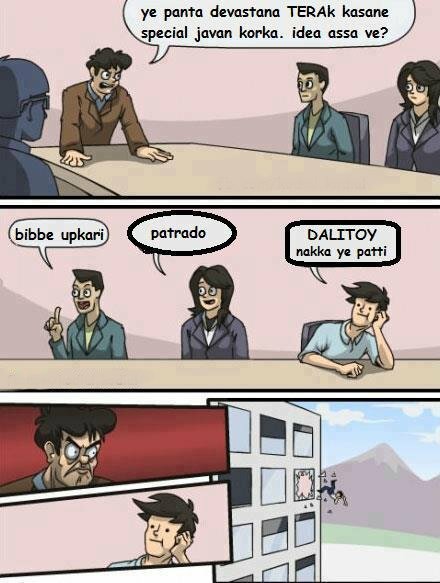 This cartoon below explains the importance of dalithoy. Sorry, you may not understand it if you do not know konkani. 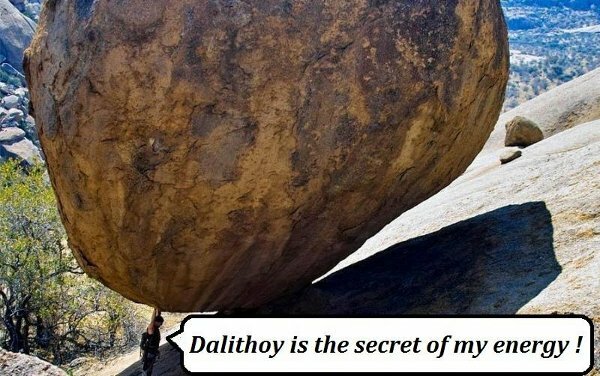 Dalithoy is the secret of our energy! !